The audience erupted into sustained applause that lasted over twenty seconds until Jake Tapper interrupted. In 2016, Hillary Clinton won nearly three million more votes than Donald Trump yet still lost the election. It doesn’t get much more undemocratic than that. While ostensibly divided by population, the number of electors representing each state are an unfair representation of the number of voters. In California, there are 508, 344 people per electoral vote (the state is 49th in voting power) and in Florida there are 510, 318 (Florida is 50th in voting power). In Wyoming there are 142,741 voters per electoral college vote, making it the state with the number one highest vote power. Democrats have won the popular vote for president in six of the last seven elections. This is one of a number of fronts that Republicans fight for to maintain an electoral advantage. While the Electoral College may be hard to eradicate out of existence, The National Popular Vote bill will take effect when enacted into law by states possessing 270 electoral votes (a majority of the 538 electoral votes). It has been enacted into law in 13 jurisdictions possessing 181 electoral votes, including 4 small jurisdictions (DC, HI, RI, VT), 5 medium-sized states (CO, CT, MD, MA, WA), and 4 big states (CA, IL, NJ, NY). The National Popular Vote bill has now passed a total of 37 state legislative chambers in 23 states. It has also passed one legislative chamber in 8 states possessing 72 electoral votes (AR, AZ, ME, MI, NC, NV, OK, OR). It has been unanimously approved at the committee level in 2 states possessing 27 more electoral votes (GA, MO). 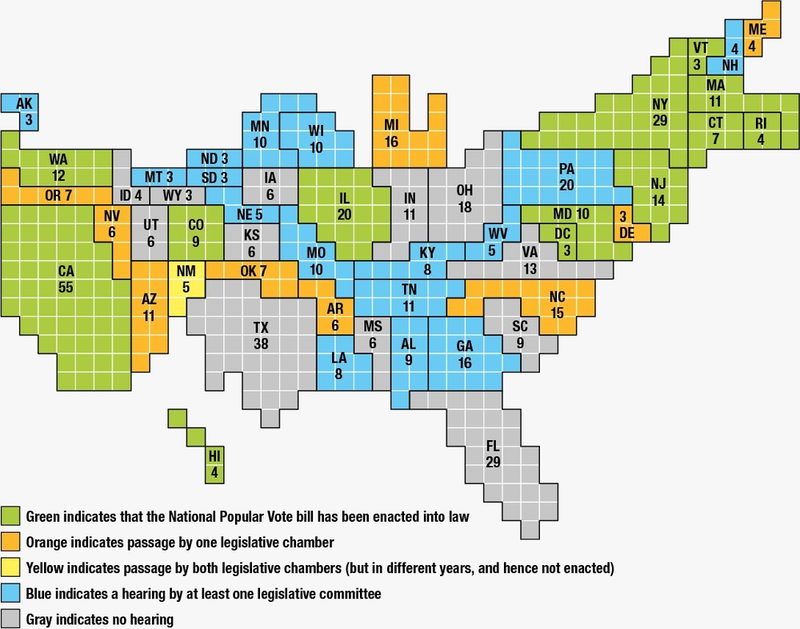 The National Popular Vote bill has been introduced in various years in all 50 states. On the map below (courtesy of Victor Bobier), each square represents one electoral vote (out of 538). This is a great reminder that wherever you are in this country, you can still do something to tighten the bolts of our rickety democracy. Besides, after the 2016 election, when revelations emerged from the Steele Dossier that the president-elect could well be compromised by a foreign country and in fact be Russian asset, state electors couldn’t be bothered with entertaining the idea that they serve as a safeguard against "foreign powers" that try to "gain an improper ascendant in our councils" as Alexander Hamilton had hoped. In fact, more electors tried to break from voting for Hillary Clinton, in defiance of both the national popular vote and the state. One elector decided to vote for “Faith Spotted Eagle” because he didn’t like Hillary Clinton’s record with Native Americans. The Electoral College is a meaningless charade that lets its members opt out of adhering to voters’ wishes while pushing nationwide campaigns into just a few major media markets.